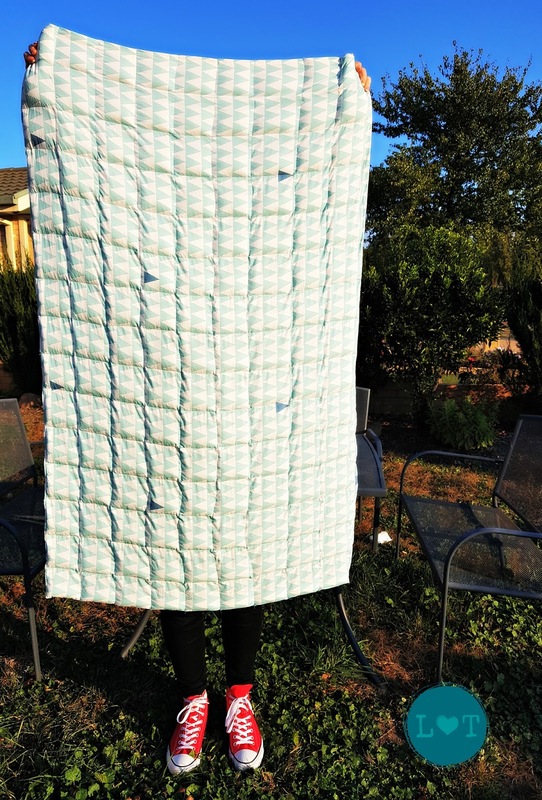 In case you haven't heard about them, Weighted Blankets are taking the (sensory) world by storm. They are a type of quilt which has some kind of material sandwiched between the layers to give weight. The idea behind this is that many people (often on the Autism Spectrum, but not only!) find it calming to have something like this either on their lap or over their whole body. 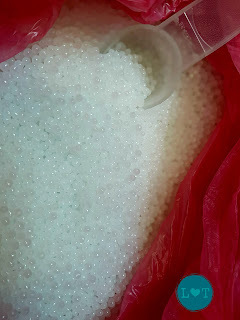 The weights can be from a number of materials, but a common option is the use of Poly Pellets, the same as those used for stuffing toys, especially Beanie Toys. A dear friend of mine has been researching these as options for her child, but they are quite expensive. So I volunteered to make one for her. Sharing what we did in case it's useful for anyone else. In all honesty, weighted blankets are worth what you pay for them. The materials are not overly expensive, however, there is a LOT of work involved in making them. It probably took us a total of 2 days to complete ours, with lots of help. It could have been done a little bit quicker, but not much. In addition to the work involved, the shipping of something heavy is expensive! For our person, we calculated that we needed 5kg of beads. They weren't particularly expensive, but the shipping cost more than the beads. The Poly Pellets - everyone liked playing with them! 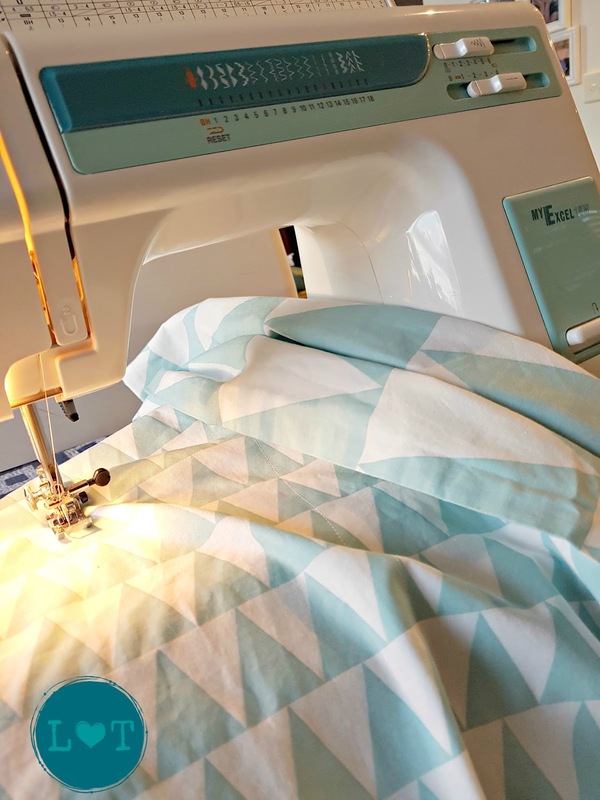 If you are someone who is handy with a sewing machine and likes problem solving, then this is what we did. I liked that there were explanations for how she approached it, and she has also incorporated suggestions from others who've made a blanket. Edit: we chose this because it's 100% cotton, and from experience we like how the Ikea fabrics wash and wear. It's worth checking what your recipient prefers, because many people have strong reactions to the feel of particular fabrics. 100% cotton is usually a good choice, but sometimes tricky to find so it's worth checking before you buy! It may also be checking what to wash it with before you commence too - lots of people react to different laundry detergent, so use the one they prefer. 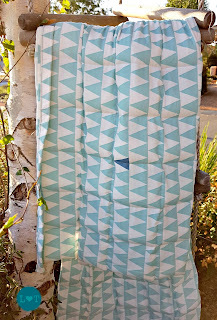 These blankets are washable, but they are going to be heavy to do, and it's always a good idea to pre-wash fabric before sewing! We pre-washed it. 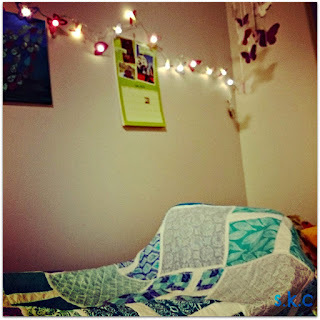 and once we laid it out to compare to it's recipient, we decided that half a single quilt would be adequate. This would suit a small adult, for handy reference. We cut the quilt in half, finished off the edging on the raw edge (turned it under twice and stitched). We left the bottom seam intact, and reinforced it by topstitching along that edge. Then the measuring began. I had my favourite Tailor's Chalk pencil with me - it has 3 colours, which was very useful for keeping track of which lines to follow! We aimed for 10cm / 4 inch square pockets for the beads to go into. We measured the vertical channels first. These were spaced at 10 cm apart, and were simple straight lines to sew from top to bottom of the quilt. This left the top of the channels open for pouring in the beads. Before we began, more measuring! We measured the horizontal lines, spaced at 10 cm, marking at intervals across the quilt. Ideally, it would be good to use a rotary tailors' chalk to draw the lines, or use a long ruler & chalk. But I was happy to eyeball it using the marks to keep the lines straight. 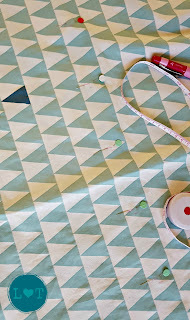 We considered partially sewing the horizontal top of each pocket, leaving an inch for filling. But we decided this was a lot of fiddling for minimal benefit. At this point we didn't have the beads, so we weren't sure how tricky it would be to get them into the pockets! Once we had measured, we had 15 channels, and 10 rows, giving 150 pockets in total. We had ordered 5 kg of beads (using estimates on the tutorial for blanket weight vs body weight). This meant we needed to divide 5000g by 150, which gave us 33.3 g per pocket. Once the beads arrived, we started measuring and pouring! This became a family affair with everyone helping out. Based on tips from the tutorial, we fashioned a long funnel out of a cardboard roll (paper towel inner) & a toilet paper roll, which we cut to fit & to have a narrower tip. 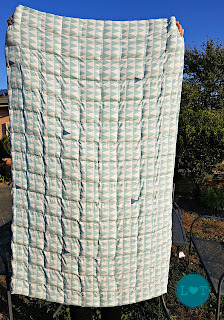 It wasn't pretty, but the cardboard worked really well for this, allowing the beads to get to the bottom of the quilt more easily. I wasn't sure if the Poly Pollets would become static using a plastic tube. 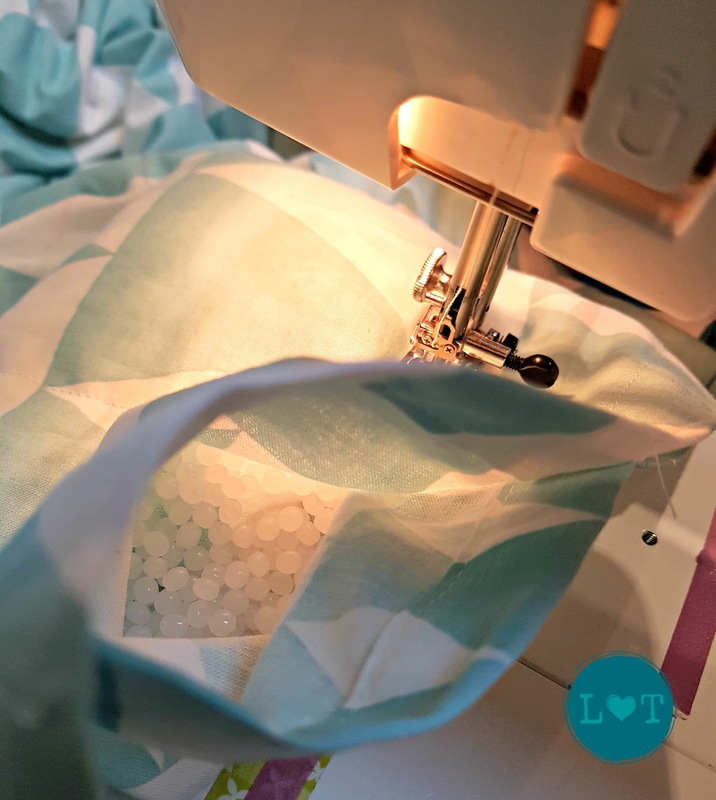 For the first few rows, it was best to measure in the beads for every channel, and then sew from one side to the other, sealing all the channels at once. We needed to keep shaking the beads into their pockets, by lifting the quilt - they did try to escape, but it wasn't a big problem! Once the row was complete, we repeated, filling each pocket with 33g of beads, then sewing off at the 10 cm marks. As we got closer to the top of the quilt, the channels became shallower. This meant it was more effective to fill one pocket and sew at a time. Then I reversed the machine to allow for manoeuvring the quilt to allow the beads to 'fall' into the pocket. Sewing the pockets - the beads look like shimmering pearls! By the end of the quilt, it had become quite heavy. I definitely had aching arms ! 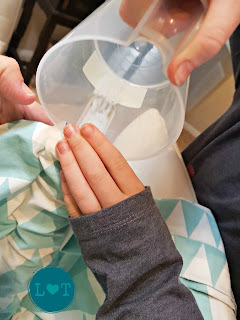 I would recommend using gloves to make it easier - light weight grippy gardening gloves (quilters use this trick). It was handy to have a large work area and helpers around to help shift the weight. We worked at the kitchen bench - the added height did seem to make it easier! Once it was finished, I added an extra row of triple-stitching to ensure the beads were safely contained! We were very happy with the end result. Everyone tried it out. It's definitely heavy, but the pockets spread out the weight which will be quite soothing. Playing with the beads through the fabric is also quite rewarding! Bottom line? Unless you like making things and a bit of problem solving, I do think it's worth the price of purchasing the completed blankets. However, we enjoyed the process, and the children practised a lot of maths skills in the process. 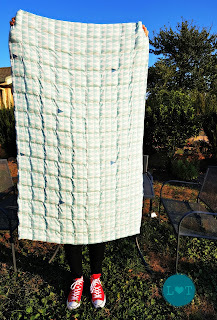 It also enabled us to make a full sized blanket for a fraction of the cost. The Ikea Quilt was $20, and the beads around $30 (check this). An equivalent quilt would have cost at least $150. So we thought it was a success! Have you had experience with making similar resources? Share your tips if you like! Happy recipient - I think it matches those red shoes, don't you? Good work Justine. I'm amazed you completed it in two days. It sounds very fiddly and that it would take quite a while. I'm sure it would have taken me more than two days.